The name of ladybird explained. Used here [link] , thanks ! Very nice detail. Also, the colors really pop. Very Nice !! Congrats on the DD !!! Congrats on the DD! It was well deserved!! 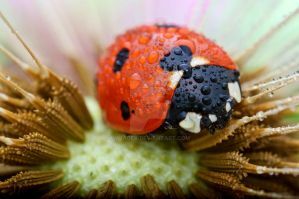 Great photo of a ladybird. Nice focus and context. Possibly the clearest photo of a ladybird I've ever seen. Nice macro! I love these beautiful beetles! Lovely photo! Congratulations on your DD! Good focus on this little guy ! One of three inscets that I'd do my best not to harm. 1st one: Butterflies: They're just so peaceful and cute. How could anyone hurt them? Yes, the butterflies are so fragile and their lifetime so short and still manage to impress us. I think I have a photo with a Praying Mantis, I'll up it up as soon as I find it. Found it, I'm gonna post it today. that's a really good shot! nice detail in the head!